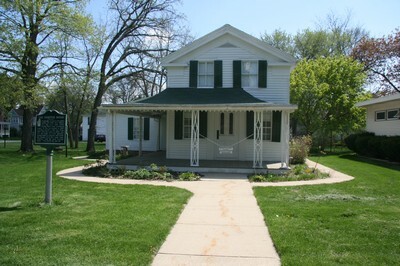 In Elkhorn, Walworth’s County Seat, you’ll find the home of composer Joseph Philbrick Webster, who songs were popular through the Civil War and beyond. The well-maintained Greek Revival-style cottage was constructed in 1836 and was originally located in Elkhorn’s public square (today’s Courthouse Square) and served as the federal land grant office, which sold land to Walworth County pioneers before Wisconsin’s 1848 statehood. It was also used as a temporary courthouse before a “real” one was constructed. The Websters moved in after the house was moved to its current location at Rockwell & Washington Streets, where they added a kitchen and bedrooms while also creating a music room. Webster’s descendants sold the house to the county in 1955; it opened a museum the following year. On August 8, 1970, the Webster House Museum was named a Wisconsin State Landmark and the official marker went in. The Webster House Museum is just south of Elkhorn’s downtown and the junctions of Highways 11 and 67; U.S. 12 and I-43 are also nearby.